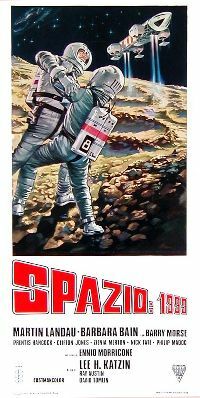 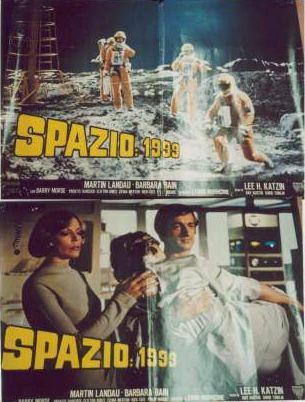 Posters used to publicise the 1975 Italian movie compiled from episodes. 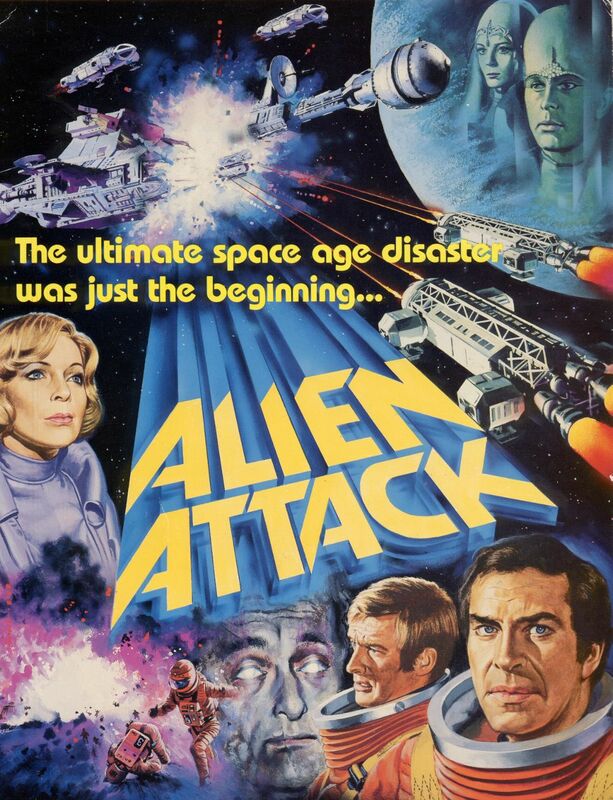 The spacesuits on the posters are white (probably as they were using black and white publicity photos). 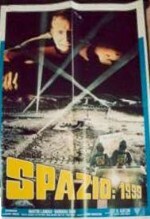 The logo (Spazio 1999) in styled identically to the English titles, with Landau and Bain having prominent credits. 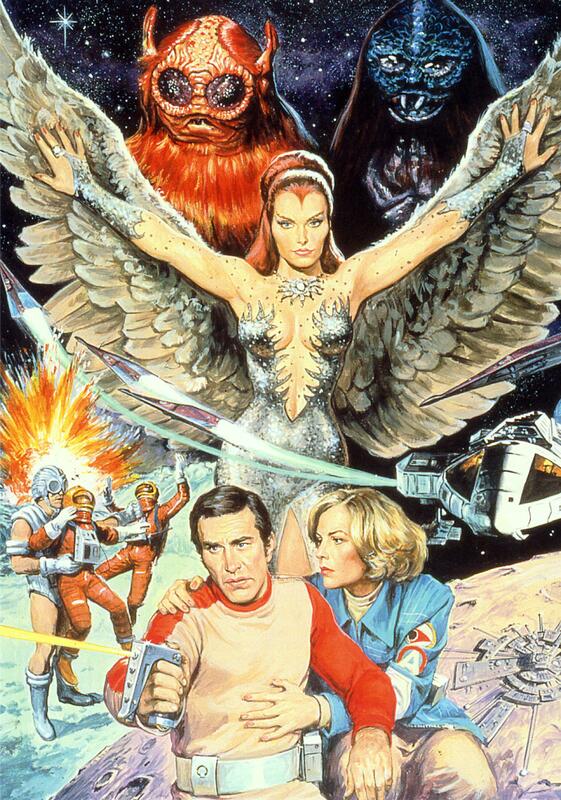 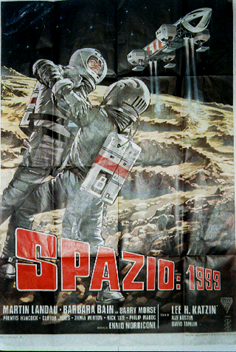 Artwork poster of two astronauts fighting on a rocky lunar surface (as Nordstrom and Steiner), with a rescue Eagle overhead. 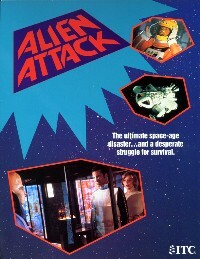 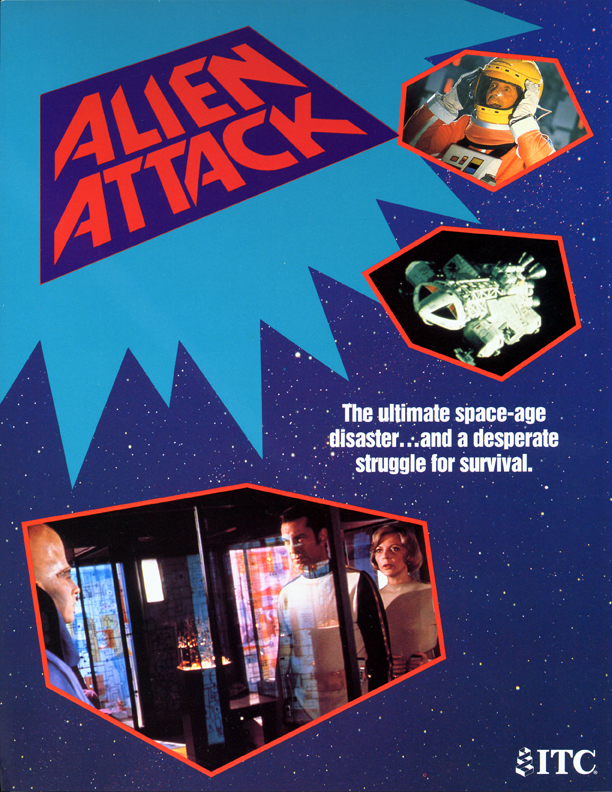 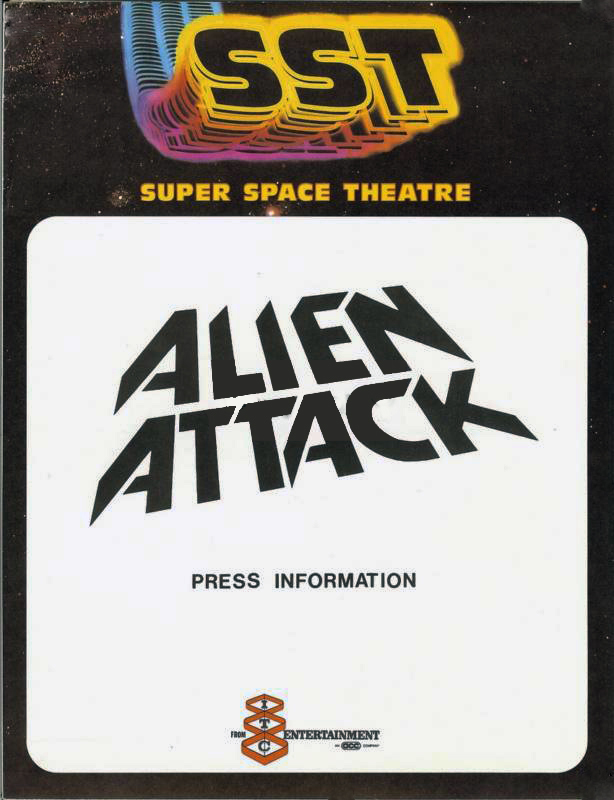 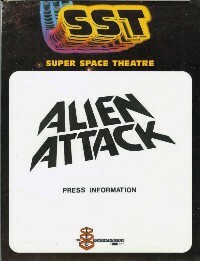 There are two versions: one with logo and credits below in a white border; the other without a border, with logo and credits superimposed over the bottom of the art. 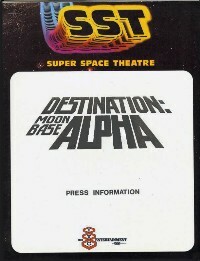 In both versions the logo is red. 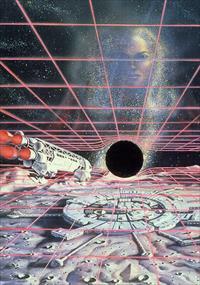 The borderless poster is 1m x 1.4m. 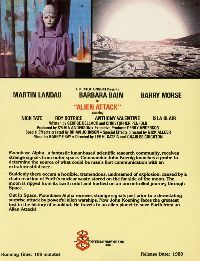 Poster with colourized photos. 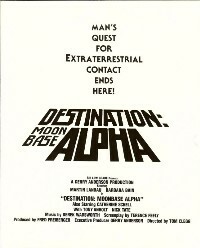 At the bottom is a montage of the lunar surface with astronauts (2 scenes from Ring Around The Moon, 1 from Black Sun); above is the logo (in yellow) with a rescue Eagle above. 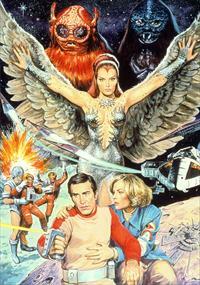 The rescue Eagle has it's landing feet removed and artwork flames coming from the rear engines. 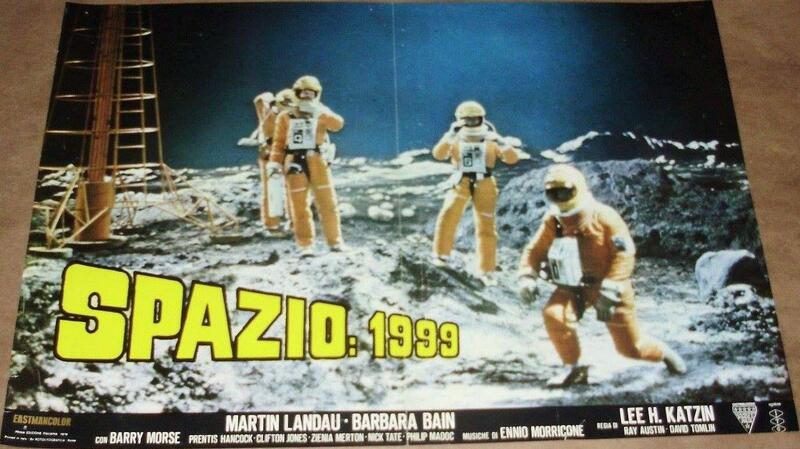 The astronauts are all in white suits; the lunar surface is distinctly brownish. 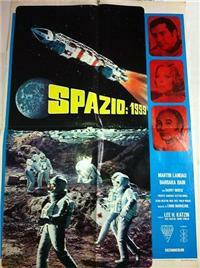 Poster dimensions are 70cm x 90cm. Double height poster. 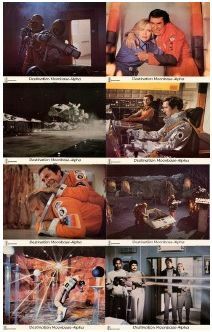 Top is Koenig clinging to a desk (Breakaway), bottom is Waste Disposal Area 2, and a moonbuggy. 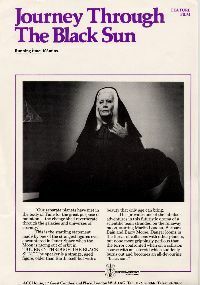 Montage of Bergman, Regina and Alan, and Helena held by Koenig. 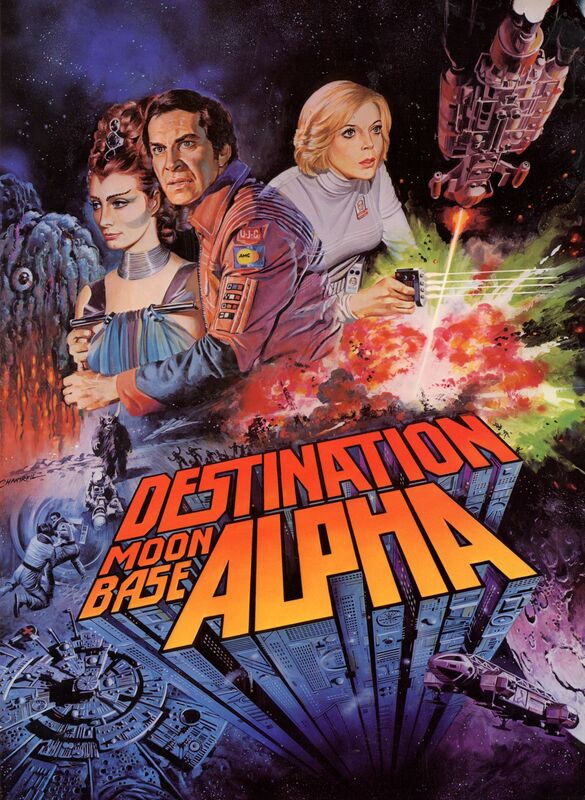 Koenig's uniform is yellowed and there is a Gemini spaceship on the monitor screen. 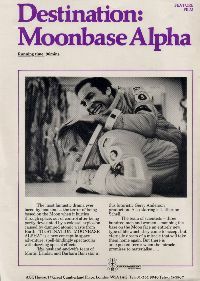 Rescue Eagle on launch pad. 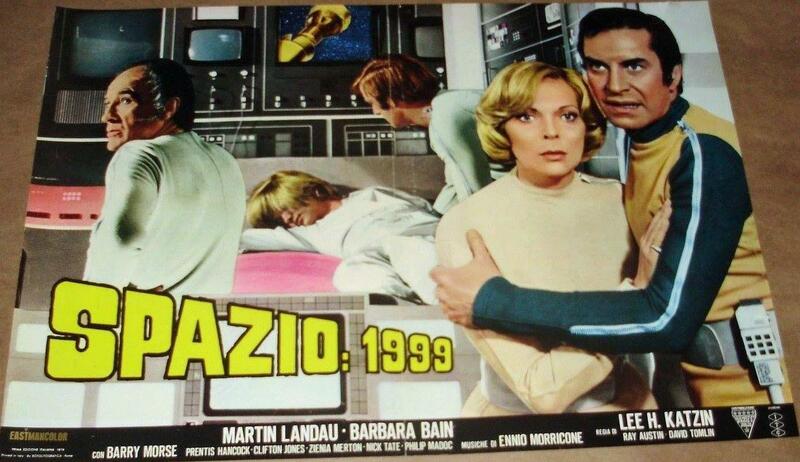 Image thanks to Marco Ciroi and Stefano Guizzardi. 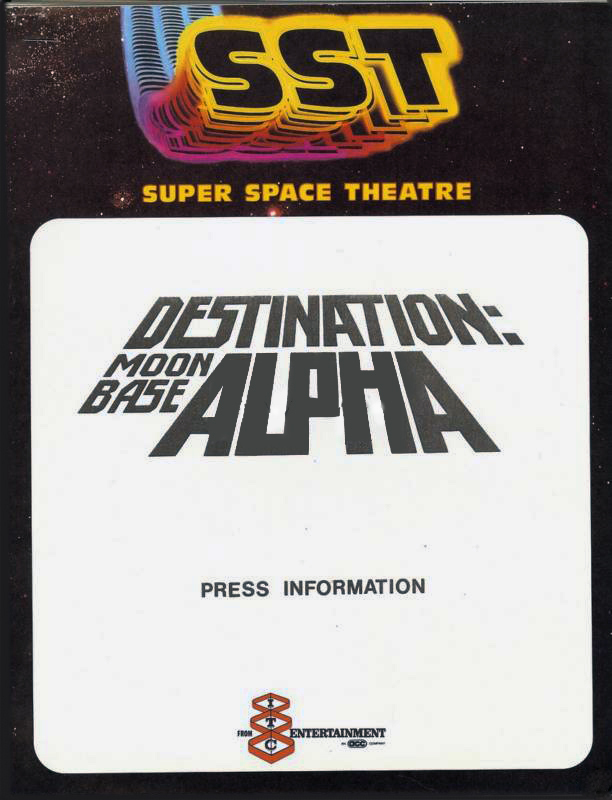 Chantrell artwork for Destination Moonbase Alpha and Alien Attack was distributed in various sizes. 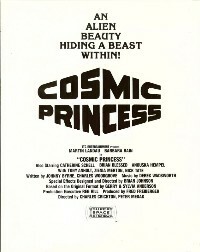 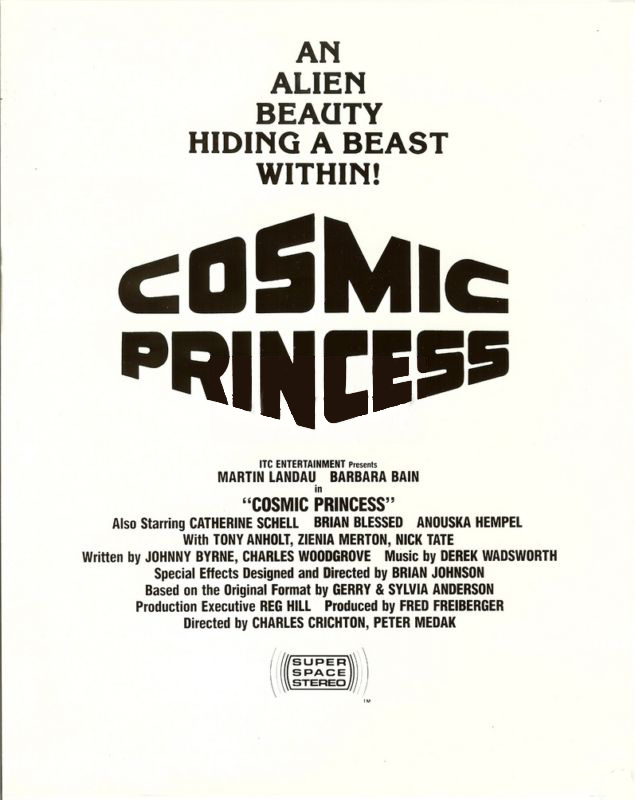 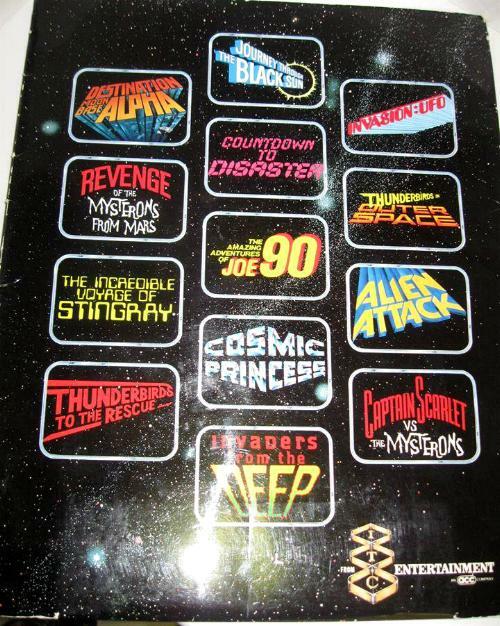 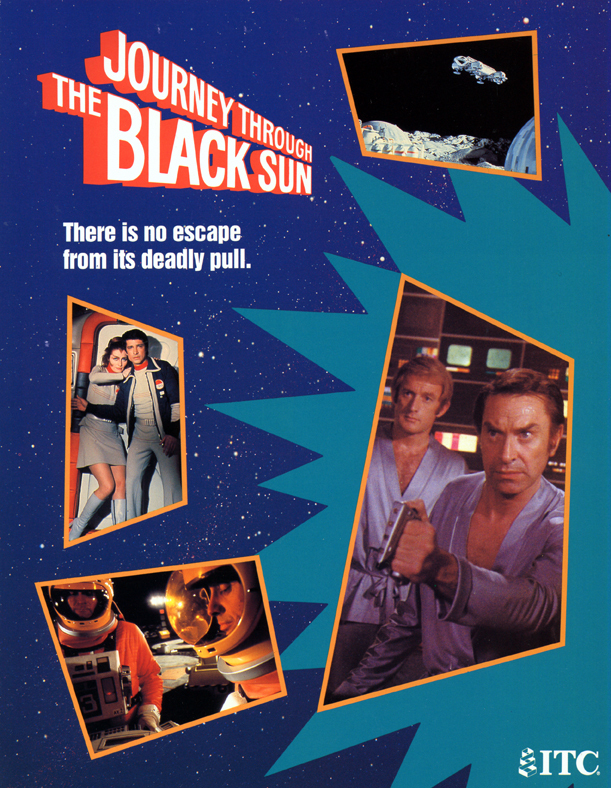 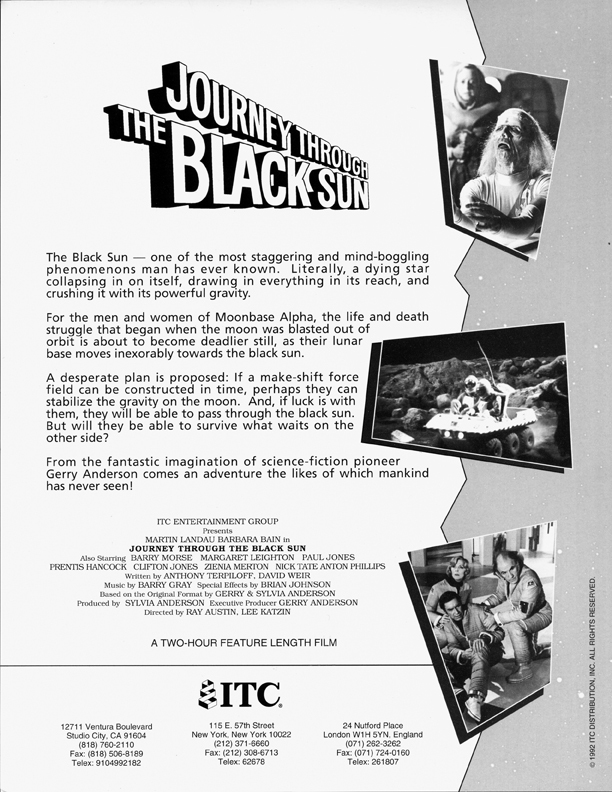 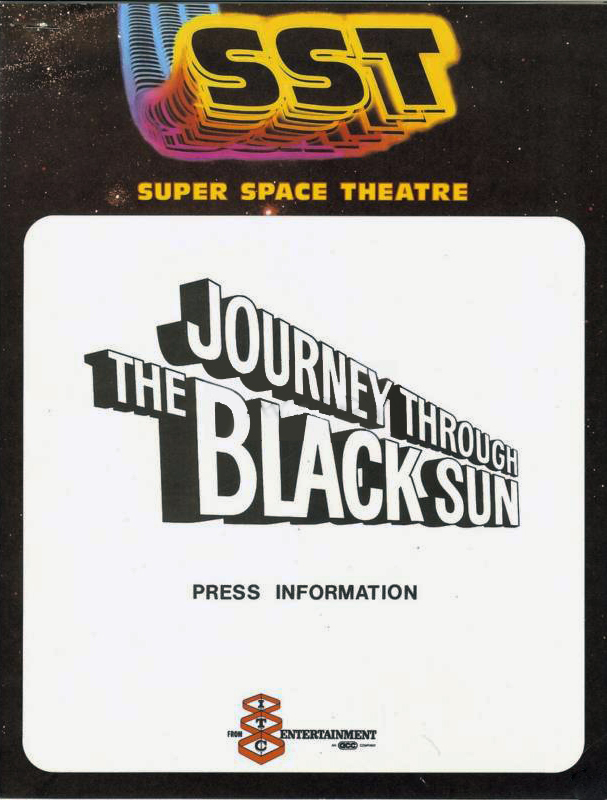 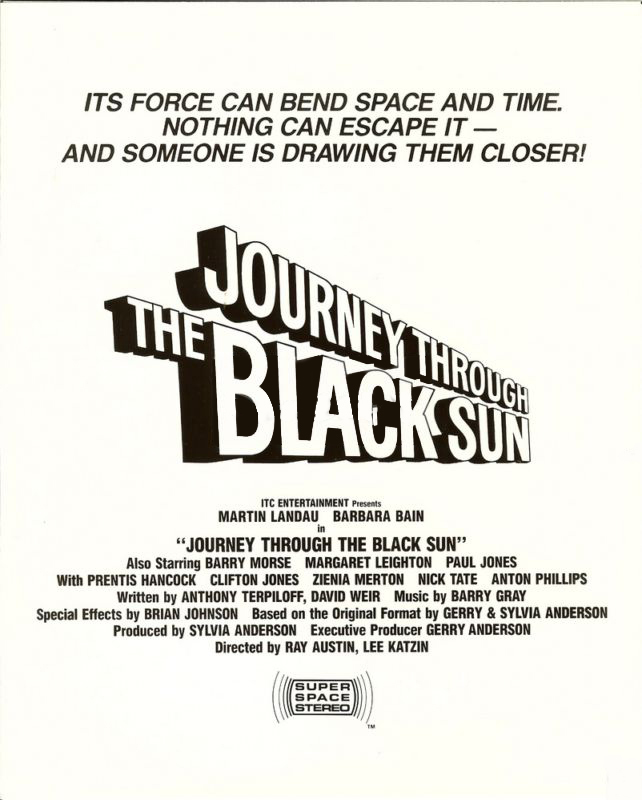 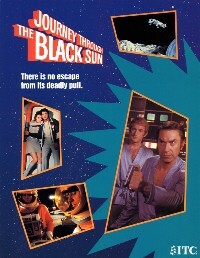 The promotional art for Journey Through The Black Sun and Cosmic Princess (which were intended for cable and video sales only) were available in a smaller range of sizes. Front of house photos were 35.5cm x 28cm; 8 were available including shots of A B Chrysalis, Seance Spectre and Brian The Brain in the Destination Moonbase Alpha set; and one Year 2 shot of Alan in the Alien Attack set. A photographic master set was also produced for each of the two films. 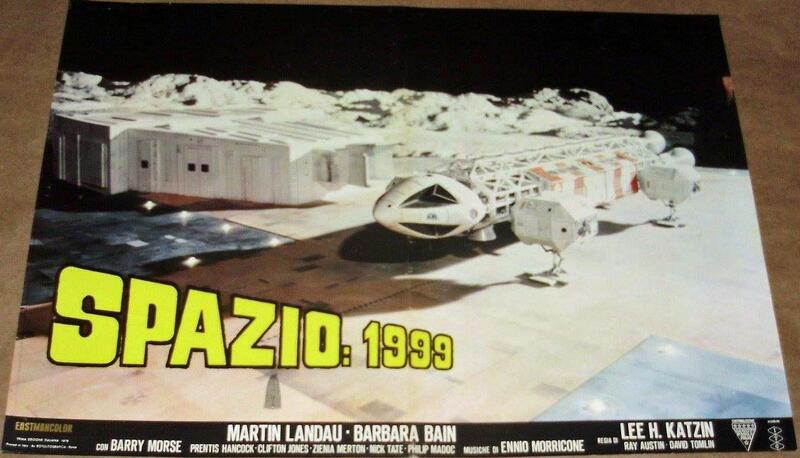 The set is 40.5cm x 50.5cm, showing 8 front of house photos and 10 others. 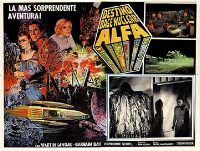 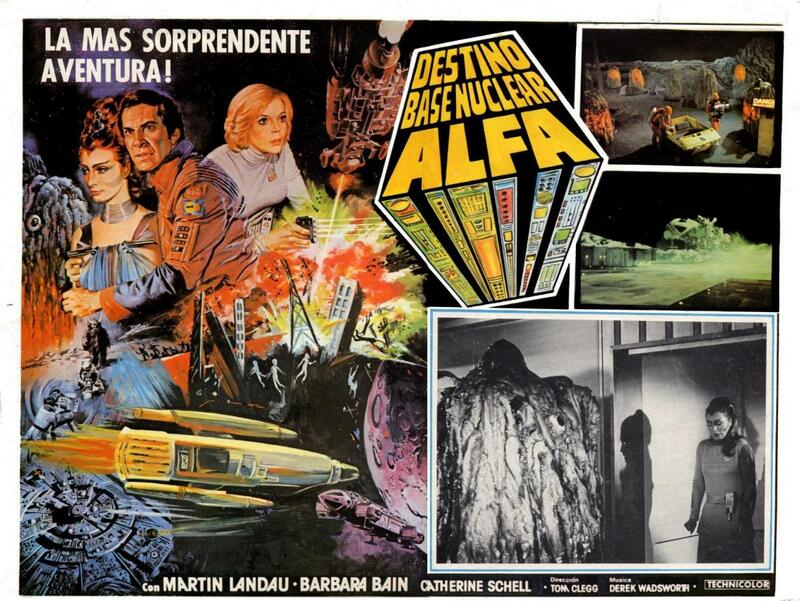 In Mexico a 12x16 inch lobby card was produced for "Destino Base Nuclear Alfa", with an odd Star Wars type spaceship painted over a reworking of the Chantrell poster. 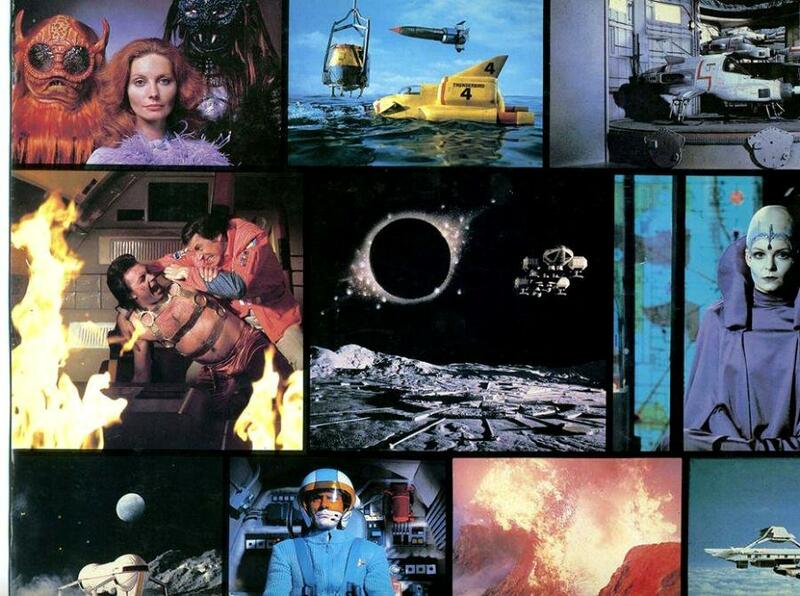 There were also three inset photos, two from the standard publicity pack, and a larger black and white scene. 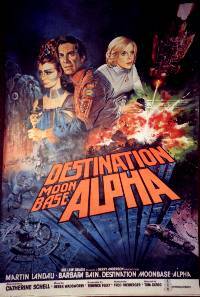 Destination Moonbase Alpha publicity images, thanks to Mark Shaw. 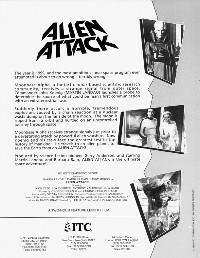 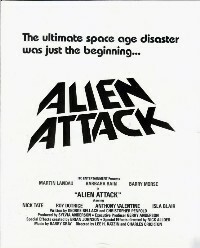 Alien Attack publicity photos, thanks to Mark Shaw. 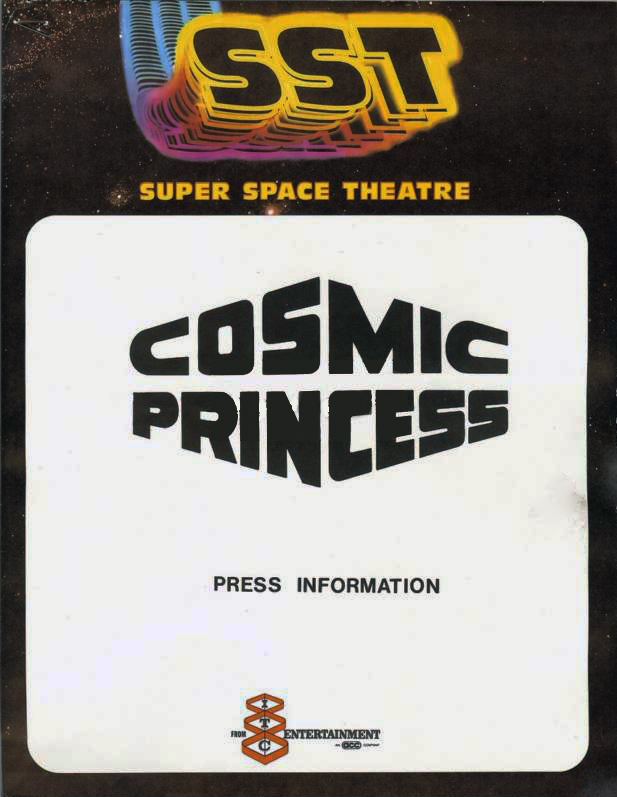 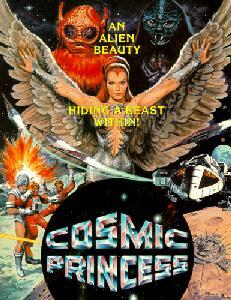 Cosmic Princess publicity images, thanks to Mark Shaw. 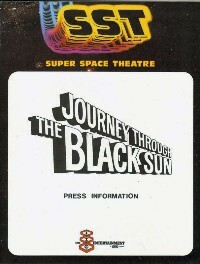 Journey Through The Black Sun publicity images, thanks to Mark Shaw. 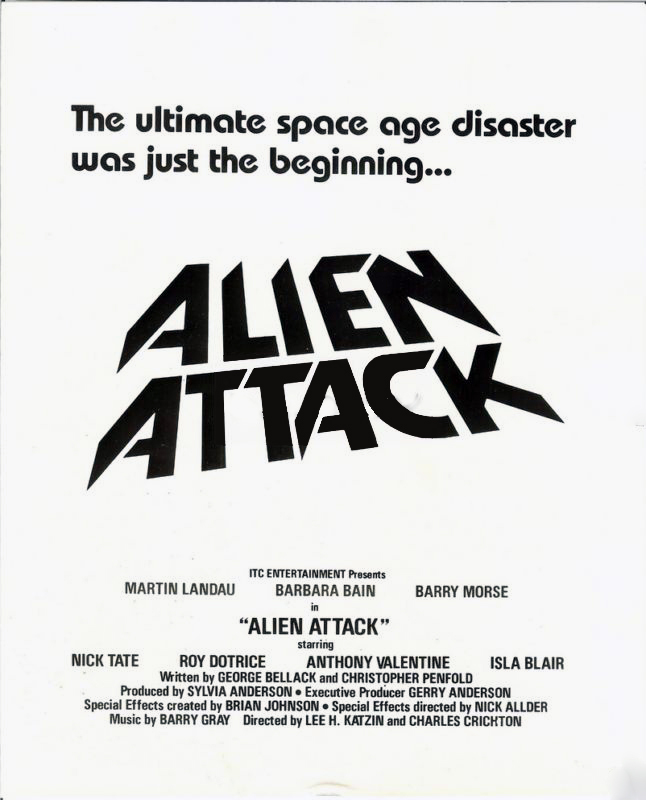 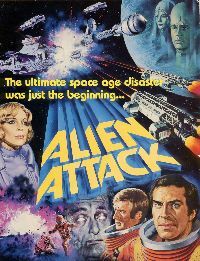 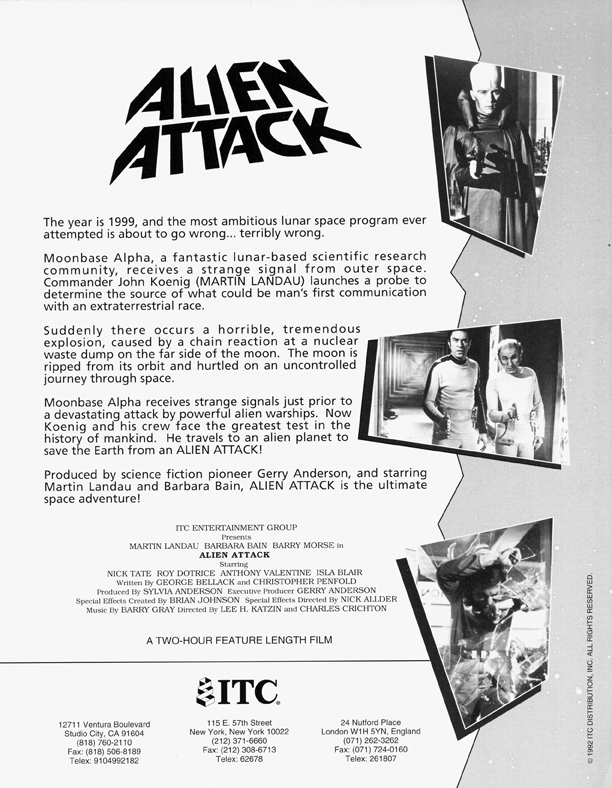 Destination Moonbase Alpha and Alien Attack had extensive publicity material, while the later compilations relied on brief fliers only. 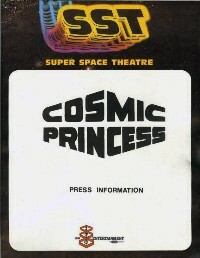 Brochure is 28cm x 39cm, 4 pages. 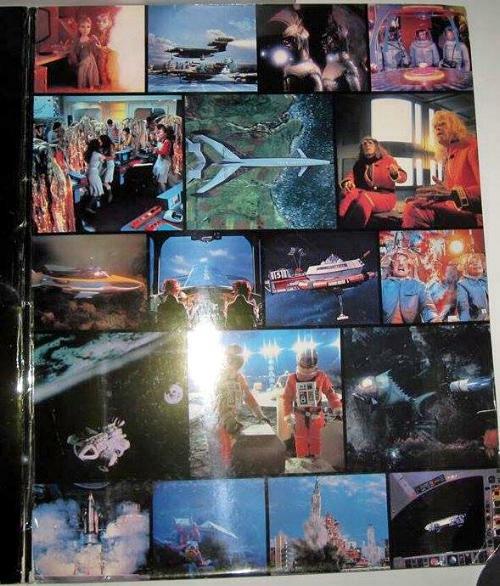 Cover is the poster, page 2 is just text (the synopses), page 3 is photos, page 4 is cast profiles. 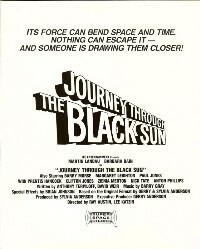 A4 glossy cards, with poster on one side, credits and plot on other side. Text booklet is 11 pages, including synopses, cast and crew biographies. 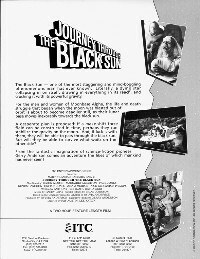 Press flier is a single-sided black and white page, with photo and short text. 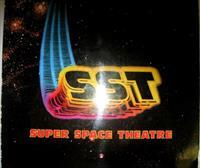 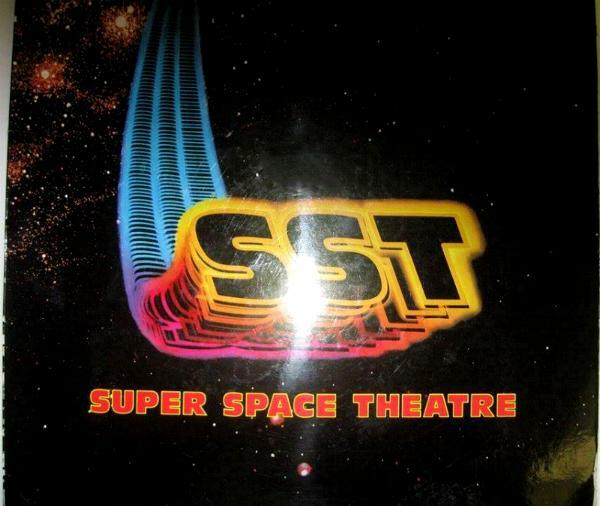 Super Space Theatre Brochure. 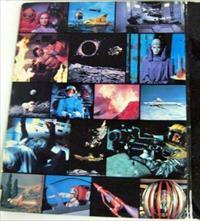 Full colour glossy brochure for all the Gerry Anderson compilation movies. 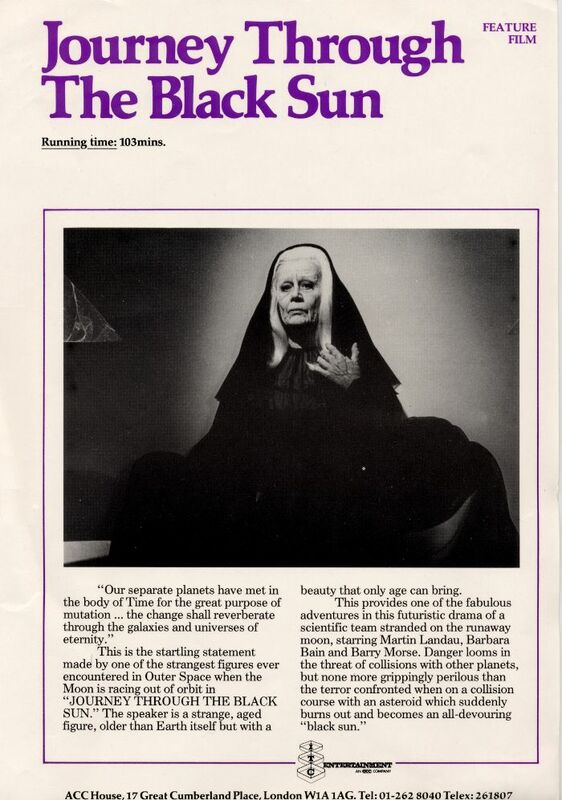 Thanks to Doug Pelton.